This DVD includes five episodes! Five Exploration Northwest episodes retrace the Klondike Gold Rush gold rush trail. Beginning in Skagway, Alaska, the film crew makes a 5-day trip in 1969, starting with a strenuous climb over the famous Chilkoot Pass, followed by a 10-day film trip in 1970 traveling 540 miles in 20-foot cargo canoes down the Yukon River from Whitehorse to Dawson City, Yukon Territory. When the S.S.PORTLAND steamed into Seattle with more than a ton of gold in July 1897, it set off an around-the-world fever and initiated one of the most extraordinary treks in history. In the brutally-cold winter of 1897-98, 100,000 people stampeded to the gold fields of the Yukon Territory. Seven decades later, McCune retraced the route of the Klondike Gold Rush with his Exploration Northwest film crew. Hiking from Skagway, Alaska, over the Chilkoot Pass, they found abundant evidence of the stampeders' travail in "...this debris-laden pattern tracing the Klondikers' folly and glory with woebegone eloquence," as McCune wrote. 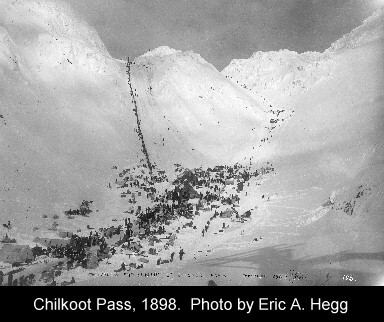 Between the end of the stampede and McCune's trek, less than 100 people had hiked the Chilkoot Trail! Here's an excerpt from the show by writer/narrator Don McCune: "While tucked away on the quiet side streets, the Skagway that was, but is no more, sits in ramshackle confusion and ponders a history that could produce a villain like Jefferson Randolph "Soapy" Smith. Smith was one who carved his own peculiar niche in the Skagway hall of fame, and before he was shot and killed by the Skagway Vigilance Committee, he conducted a rule of crime which so alarmed the stampeders that they started bypassing the place. It reached a climax when he organized a small army on the pretext of preparing them to fight in the Philippines. On July 4th he led his recruits down the main street of Skagway and the rumor spread that Soapy was about to take over the town completely!" Photographs from the Gold Rush and contemporary scenes are interspersed in a then-and-now coverage. Originally aired under the KOMO titles "Chilkoot Pass", Parts 1 and 2; and "Yukon River", Parts 1 and 2; and "Dawson: End Of The Trail".